Astro was a three-time grand sweeps winner. Michael is an all-breed Best in Show winner, a multiple Working Group winner, and a Eukanuba National Championship Award of Excellence winner. He is owned by Gary & Marilyn Richards. Flash at 3 years old. 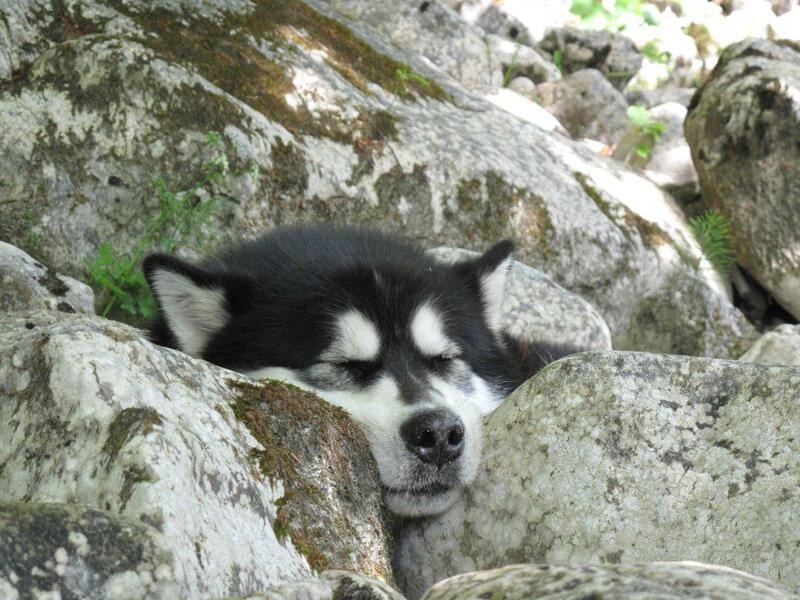 Kody stuck between a rock and a hard place. Sailor & Daisy, 3 months old. 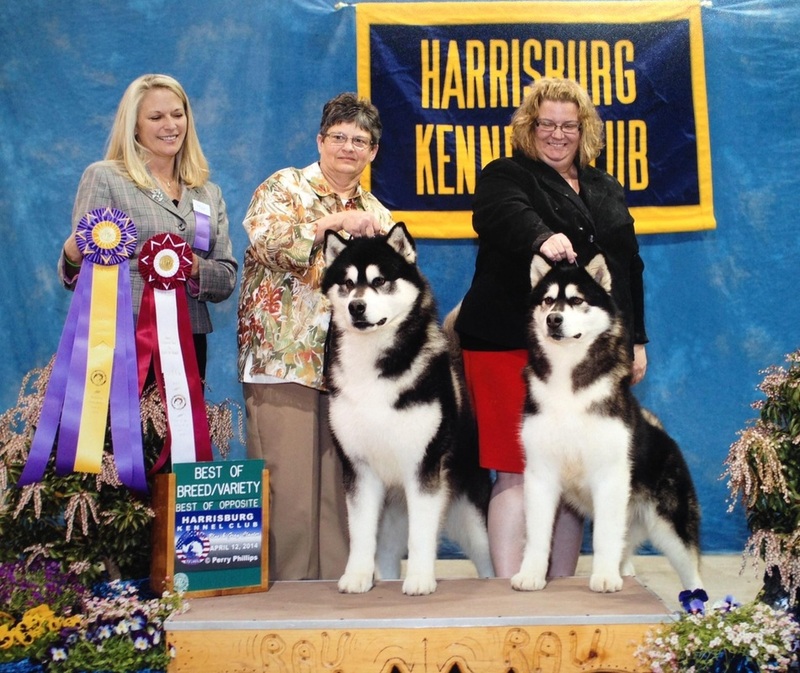 Betty, at right, winning Best of Opposite at the Harrisburg specialty under breeder-judge Robin Hug. Best of Breed (at left) was her half brother Polar, BISS Ch. Silver Shadow's Polar Express, bred and owned by Chris & Linda Frank. My first malamute was born in 1995 and since then, I've never looked back! I purchased my second malamute Jilly just a few months after the first. I began showing her in obedience and was immediately hooked! I've put multiple titles in both obedience and conformation on my dogs and friends’ dogs, and consider it a labor of love. Today, I concentrate on showing in conformation events. One of my first show dogs was Flash. What an incredible beginning he was! I learned how to groom and show this breed with him and I am proud to say that he was not only my first champion, but my first group placer and group winner, owner handled. He was a born show dog and I fully recognize that I was only along for the ride! I consider myself blessed to have been given the opportunity to share my life with Flash, and I owe his breeders Gary & Ronda Allen a great debt for entrusting him to me. I spent ten years studying pedigrees and the many wonderful aspects of this breed before taking the plunge and breeding my first litter in 2005. My hard work paid off as that litter produced multiple champions, several Best of Breed winners over specials, a multi-group placer, a three-time Grand Sweeps winner and a Bred-by Group winner, as well as satisfying companions who provide much love to their families. The credit belongs to all of the breeders behind my dogs, without whom I would never have had the opportunity to work with such wonderful animals. 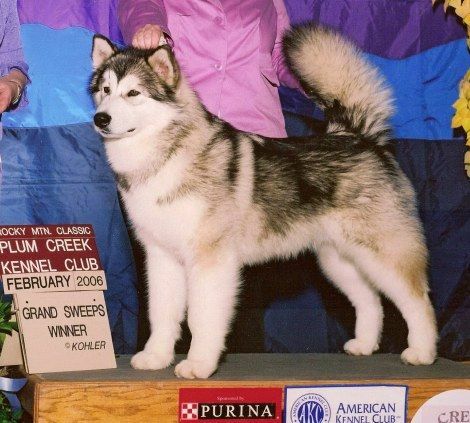 All ethical breeders of malamutes breed not for money but from a sincere desire to produce malamutes that are a credit to their breed, and they do so with the entire dog in mind. By this I mean not only good looks, but solid health and loving temperament, as well. If you are looking to add a malamute to your family, please do your research and learn the right questions to ask to ensure that you're purchasing a puppy from a responsible breeder. I firmly believe that the malamute is not a dog for everyone. It takes a special personality and strength of character to provide leadership to this hard-headed, primitive breed...but if you are suited to the task, your malamute will reward you many times over with loving companionship (and a daily source of comedy!). If you have questions about my dogs or malamutes in general, please contact me at kaviakmals@yahoo.com. 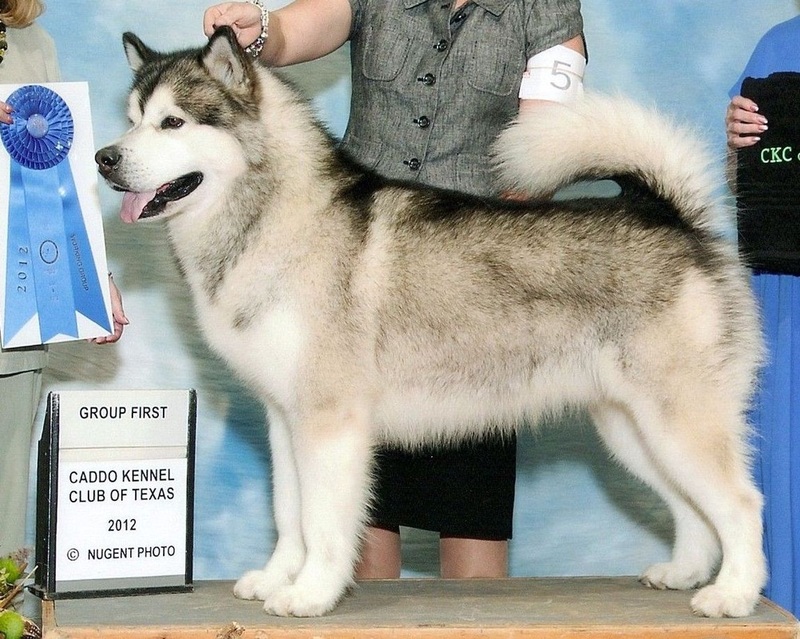 For more about Kaviak Alaskan Malamutes, read the interview below.